Before we begin, can we say: you can now shoot HD video, edit the clips into a slick movie with titles, transitions and a soundtrack, and publish it to the internet… on a phone. Amazing. It's a shame then, that this Apple iMovie app, technically only available for the iPhone 4 (though some have hacked it to run on previous models), is so basic. It reminds us of iLife '08; the revamped iMovie app was commendably fast and easy to use, but it wasn't until an enriched version appeared in iLife '09 that it became sufficiently capable for all but the simplest movie projects. And we suspect that this will be the case with this app; what we have here is a great basic movie-editing engine, but it will only become compelling with future updates. You can import video clips and still photos from your camera roll, or shoot directly into the app, and then arrange them on a timeline. Tap a clip to bring up handles that you can use to trim it, and double-tap to bring up the option of adding a title and removing the audio from a clip. Clips can be rearranged on the timeline, and you can add a soundtrack from your iPod library (copyright nightmare!). You can apply one of the themes with some cool transitions. 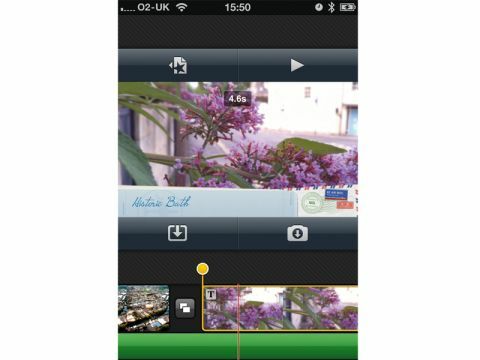 Finished projects can be exported to your camera roll from where you can upload to YouTube, for example. Frustratingly, even though the videos are in 720p, they get downsampled to 568x320 pixels when published. There's no option to split a clip – though you could import it twice and trim – and while soundtrack audio ducks when clips contain audio, there's no control over levels, fading or looping.